Tonnage doesn’t have anything to do with how much an HVAC system weighs—although more powerful systems are usually larger. A ton is a measurement of heating/cooling power. One ton equals approximately 12,000 BTUs (British Thermal Units) of heat. One BTU will heat or cool one pound of water by one degree Fahrenheit. Since calculating most commercial systems would require dealing with enormous BTU numbers, the larger measurement of tons is used instead. It’s the amount of heat or cooling needed to change the temperature of a ton of water. What Is the Average Tonnage in HVAC Systems? The tonnage range for HVAC systems such as rooftop units is enormous. To give you a general sense of what it takes for proper heating and cooling, the average home uses an HVAC system between 1 to 5 tons. A light commercial system is one 25 tons or below, and anything above is consider standard commercial—and industrial systems are even higher. How Do I Know the Tonnage Necessary for My Facility? If you feel a bit confused about just how much heating and cooling your commercial facility needs to meet your needs (everything from employee comfort to temperatures to protect equipment), you don’t need to worry. Unless you’re a licensed and experienced commercial HVAC contractor in Toronto, ON, you won’t be able to determine tonnage on your own. You can use quick rules of thumb based on the square footage of your facility, but this still won’t give you an accurate answer—many factors beyond square footage affect heating and cooling. Your facility may need much higher levels of heat to allow for process, or perhaps more cooling to keep equipment from overheating. There are a few mistakes commercial facility owners often make when they start looking for HVAC installations. The first is to go for the most expensive system they can afford. Oversizing a system is a big problem, since it will make the system an energy waster that will rapidly wear down. Often, the less expensive choice is the right match. The second mistake is the assumption that when replacing an old unit, a new unit of the exact same tonnage will do. Because HVAC equipment is advancing all the time, you may no longer need the same type and tonnage of system. 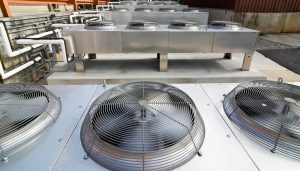 Always let experienced, professional commercial HVAC contractors handle the job of installation and replacement. You can depend on our team and our 30 years of experience to ensure you have the best installation or replacement. We’ll perform an extensive heat load calculation to determine the exact tonnage needed for your facility. Advantage Airtech Commercial Ltd. is the Double “A” Name with the Triple “A” rating! Schedule an appointment today.